This guide is how to turn a Raspberry Pi into a host Wireless WiFi hotspot. First what does that mean? This will not turn your Pi into a wireless router (although you'd be half-way there), but instead provides a way to connect and control a Raspberry Pi using a dedicated wireless network. The reason I wanted this was to control my Raspberry Pi powered robot. 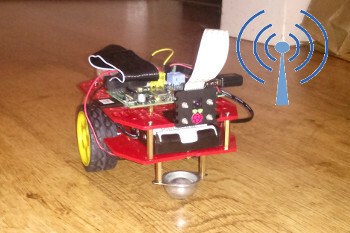 Originally the Raspberry Pi robot was configured to connect to my existing home WiFi network, which worked great at home, but meant that if I took the robot out to show at a Raspberry Jam (such as PyCON UK Raspberry Jam in Coventry) then I would either need to take my wireless network with me, or find a wireless network at the event and reconfigure Raspbian to use the wireless network provided. This is similar to how the GoPro Hero 3 camcorders work. This is based on the Raspbian image on the NOOBs SD card. This is easiest using a serial connector connecting to the GPIO ports, but can be done by switching between the keyboard and USB WiFi dongle when required or by using a USB hub. First make sure your Raspbian distribution is up-to-date. It's a good idea to check that the wireless dongle is able to support Access Point mode (WAP). Most do, but there are some dongles around that do not. This is not actually required if you know your dongle definitely supports this, but there is no harm in doing it anyway. First install the iw utility which is used to query the wireless adapter. use the cursors to move around and press q when complete. This configures the Raspberry Pi with a static IP address. Assuming the dongle supports wireless mode we can proceed to adding the relevant software. We will be using hostapd to provide the access point function and adding a DHCP server isc-dhcp-server which will give out IP addresses to devices that connect. You will get an error saying unable to start the dhcp server. This is because we have not yet configured the server, don't worry once it is all configured you shouldn't get that message any more. Now we will configure the dhcp server so it is ready when we configure the access point. Edit the /etc/dhcp/dhcpd.conf file - eg. Comment out the domain name servers as we don't need them for this set-up. They can be commented out by adding a hash character at the start of each line. I have created a large subnet (254 addresses, but set it so it can give out 50 entries) this is far more than we need for this. The dhcp server is configured. Now to configure the access point. Now reboot the Raspberry Pi and you should be able to see the new wireless network on another device (eg. Mobile phone / tablet) and connect to it. You should then be able to ssh to the Raspberry Pi @10.5.5.1 If there is a problem then look at the appropriate section. For example if you cannot see the wireless network check the WAP settings, if you see the wireless network, but you don't get an IP address then check the DHCP settings etc.